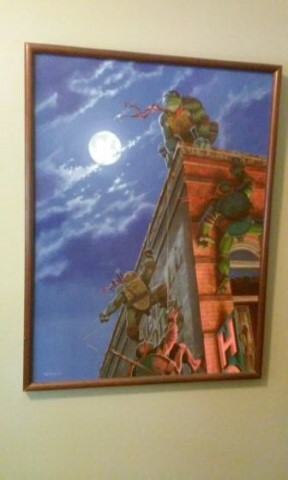 In the wake of the recent release of Teenage Mutant Ninja Turtles: Out Of the Shadows, it is only seems appropriate and fitting to recognize a major contributor to the creation and success. 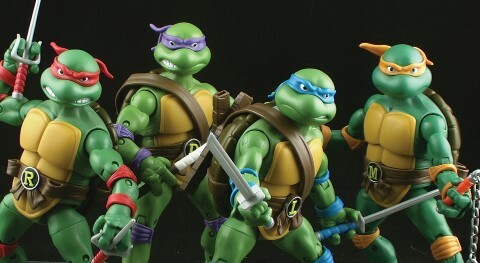 It was as a young boy growing up in Groveville; that small town located right between Gorham and Buxton, that co-creator Kevin Brooks Eastman began his interest that would develop and eventually evolve into this franchise we all know and continue to enjoy today. Eastman’s interest would come naturally. He had always believed his interest in art history and the associated skills were inherited. They can clearly be traced back to the exposure of his Grandmother’s watercolor paintings and copying over his father’s car and motorcycle drawings. His mother too was always busy doing something creative and still actively paints today. Add to this mix a huge interest in Bruce Lee and well, it is heredity. Then there was the exposure to the reading his first issue of Jack Kirby’s comic book character Kamandi. This would further fuel his passion, followed up by the discovery of Heavy Metal Magazine and the artwork of Richard Corben. Inspired, he would seek further for more of Corbens work. What he would discover along the way is a network of underground publishers. It was here Eastman would showcase his artwork and ideas and many rejections would follow. Above ground even Walt Disney rejected the idea, saying it was ridiculous. Thankfully for his persistence, after several rejections from those underground publishers’ one of the smallest, Clay Geerdes (“Comix Wave”) would be his first publisher. Enter Peter Laird and Mirage Studios (Laird’s living room). By pooling money with Peter Laird and acquiring a loan from a relative, the first issue was released. To their amazement it was well received; this despite the main villains being killed off, terminated because they believed TNMT’s popularity would be short lived. After all, it really had been created just for fun. And so a childhood dream had been fulfilled, yet real life persisted, prompting Kevin’s return that summer to cooking lobsters in Ogunquit. Further communication with Laird to consider a second issue ensued. By the time that second and a subsequent third issue were released TNMT was selling more than The Avengers. What started out as a parody and a tribute with respect to Jack Kirby and Frank Miller characters, Eastman’s favorite idols at the time, TMNT would take on a life of their own. We all know the Turtles names are derived from Renaissance painters, but the real interesting thing is that their personalities were a reflection of those who created and embellished them. 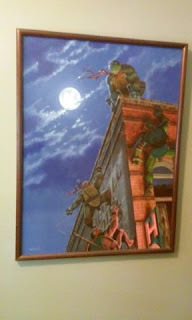 Raphael is based on Eastman, Donatello based on Laird, and Michelangelo on Steve Lavine, an artist and high school friend who joined the team after Mirage expanded. Leonardo, well he is just the stereo typical Casey Jones that was inspired Kurt Russell’s portrayal of “Jack Burton” in the movie “Big Trouble, Little China”. Even April O’Neil had roots, designed after a girl Eastman dated in high school and later married. While attending Westbrook High School he painted a mural on the walls within and to this day it remains. Presently Kevin is busy travelling the world for book signings and occasionally showing up on the movie set. If you missed his cameo appearance in movie one as a garbage collector, keep looking. You never know when he may be looming. Perhaps as a pizza delivery guy. Meanwhile, if you just can’t seem to get enough of this bizarre anthropomorphic quartet, then a must read for current fans and those just signing on is Kevin Eastman’s book, an Artobiography entitled Turtle Power: The definitive History of the TMNT. It is an invaluable resource from which much of this writing was obtained. It is also within these pages you will see never seen before drawings along with little know facts and trivia like the surfer phrase Cowabunga was actually adopted by an exclamation made by Charles Shultz’s’ Snoopy when he was surfing; that he owned the original Batmobile and consequently sold it to David Copperfield; that he had dated Jean Paige Turco who played April O’Neil in the TNMT II (’91) and III (’93).